The destroyer USS Sterett (DD-407) had a distinguished WWII record with the highlight being her performance during the Third Battle of Savo Island on the night of November 12-13, 1942. Sterett earned the Presidential Unit Citation for extraordinary heroism during this battle in which she engaged a Japanese battleship and light cruiser and sank a Japanese destroyer, which blew up immediately when Sterett's guns found their target. On April 9, 1945, Sterett came under attack by four kamikaze aircraft. The destroyer's guns downed the first three planes, but the last kamikaze struck Sterett just above the waterline and put the ship out of battle for the rest of the war. Tin Can Sailor provides exciting firsthand accounts of key events from Sterett's commissioning in August 1939 to her decommissioning in November 1945. C. Raymond Calhoun served as an officer aboard the destroyer Sterett from 1939 until April 1943, when he had to be hospitalized in the States in order to recuperate from a gunshot wound received during battle from a Japanese plane's machine gun bullet that had severed his radial nerve and paralyzed his right hand. He served as gunnery officer during the Third Battle of Savo Island and was promoted to Sterett's executive officer in February 1943. During his hospitalization, he wrote about his experiences aboard Sterett, which formed the foundation for this book published several decades later. He effectively supplements the destroyer's story with anecdotes and personal accounts from more than 50 former crewmen that he collected starting with Sterett's biannual reunion in 1987. 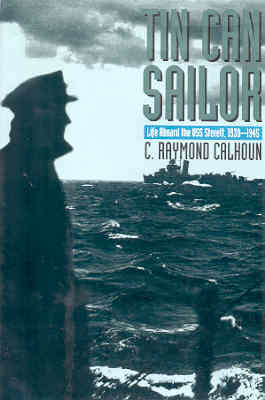 Calhoun previously published in 1981 another book on naval history entitled Typhoon: The Other Enemy about the typhoon that hit the US Third Fleet in December 1944. 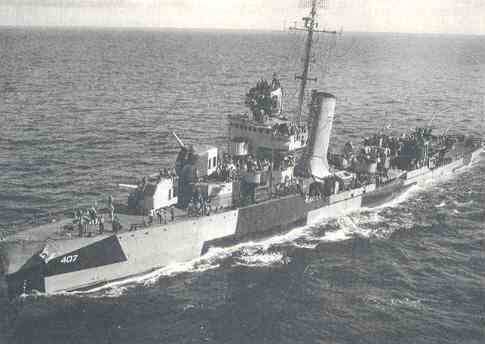 Calhoun at that time commanded the destroyer USS Moale (DD-693), which barely survived the typhoon that sank three other destroyers. The book's tone and style change abruptly after Calhoun departs Sterett, since he relies on long quoted personal accounts from other crewmen rather than using his own personal experiences as a base for the narrative. For example, Commander J.D. Jeffrey provides a seven-page account of Sterett's second nighttime surface battle in the Battle of Vella Gulf during the night of August 6-7, 1943. Sterett and five other US destroyers sank three Japanese destroyers during the battle without getting hit at all. This complete success contrasted sharply to Sterett's first nighttime surface battle at the Third Battle of Savo Island with 32 killed and 13 critically wounded. The destroyer was hit by 11 enemy shells (including three 14-inch projectiles) but managed to leave the battle area under her own power. Repairs in the States did not get completed until three months later in February 1943. Sterett's history gets covered chronologically in the book's 11 chapters, with the long chapter on the Third Battle of Savo Island being the highlight as Calhoun provides an eyewitness account of what happened from his position as gunnery officer. The kamikaze attack that put the destroyer out of the war gets covered in about three pages, mainly consisting of quoted material from Gordon Williams, commander of Sterett at the time, with the Chief Engineer also providing his account of the attack while in the forward engine room. The Epilogue gives Calhoun's personal story of what happened to him after he left Sterett for the hospital until the end of WWII. An appendix gives the names of over 800 men who served aboard the ship and includes their service dates and ranks. In Japan's first mass kamikaze attack during the Battle of Okinawa on April 6, 1945, a kamikaze aircraft almost hit Sterett, but the destroyer's gunners shot it down. It crashed into the sea about 30 yards off the starboard beam. Sterett also assisted that day in downing five other Japanese aircraft. She was ordered the next day to Radar Picket Station No. 1 directly north of Okinawa, where the destroyers Bush (DD-529) and Colhoun (DD-801) had been sunk during attacks by multiple kamikaze planes. On April 9, five planes identified as Vals (Type 99 Dive Bombers) headed for Sterett, but one changed direction toward two smaller LCS landing craft at the same picket station. Sterett's 5-inch guns downed two Vals quite some distance away. The remaining two planes continued their approach with machine guns blazing. 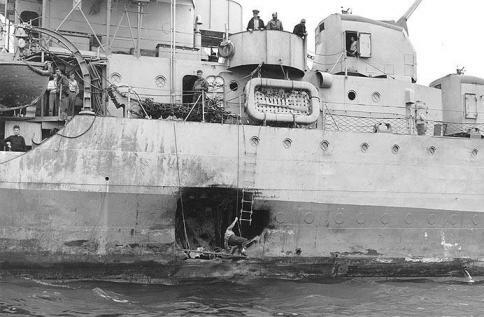 The destroyer's gunners sawed off the wing of one attacker, which hit the water about 50 yards off the starboard beam. Commander Gordon Williams writes, "One wheel of the plane ricocheted and wedged under the starboard anchor chain." The last Val hit Sterett just above the waterline on the starboard side and opened up a ten-foot hole. The crash caused moderate damage requiring repairs in the States, but there were only minor injuries to the crew. The destroyer made it under her own power to Kerama Retto, where a photo taken there shows the extent of the ship's damage caused by the kamikaze attack (see photo at bottom of this web page). Calhoun's well-justified pride in Sterett's accomplishments, battle performance, and crewmen is reflected throughout the pages of Tin Can Sailor. This well-researched book successfully integrates Calhoun's personal experiences and former crewmen's accounts to tell the story of this "gallant fighting ship" described in glowing language in the Presidential Unit Citation below. "For extraordinary heroism in action against an enemy Japanese Task Force during the Battle of Guadalcanal on the night of November 12-13, 1942. Fighting boldly and with determination against units of the powerful enemy Fleet intent on bombarding our airfield at Guadalcanal, the U.S.S. STERETT successfully engaged three Japanese vessels at close range during the thirty-four minutes of furious action. Scoring numerous hits on an enemy light cruiser, she then closed range to 3000 yards and fired a full salvo of torpedoes to cause two large explosions and assist in sinking a battleship. When an enemy destroyer was sighted at 1000 yards from her starboard bow, she immediately took it under fire and, with two torpedoes and two five-inch salvos, exploded and sank the vessel before it could open fire. With her after section severely damaged and burning and with both after guns disabled as the remaining enemy ships concentrated their gunfire on her, she fought desperately to control the damage and succeeded in retiring from the battle area under her own power. A gallant fighting ship, superbly handled by her officers and men, the STERETT rendered invaluable service in defeating a major enemy attack at this crucial point in the Solomon Islands Campaign."